2010 February – The team came together. 2010 August – Ecological survey completed. 2011 August – Reached agreement with the two landowners, whose permission we need. 2012 February – Planning permission granted for the scheme which required assent from the Environment Agency as a statutory consultee. 2012 March – Pre-design feasibility study report provided by Spaans Babcock. 2012 May – Started work to stabilise the weir. This involves filling two holes on the downstream slope. 2013 June – Completed stabilisation of weir. 2013 September – Agreement for Lease and access agreement signed. Abstraction licence and fish pass approval received from the Environment Agency. 2014 February – funding raised from the share issue. 2014 May – contractors on site to begin construction. 2014 November – handover and generation began. The financial plan is based on figures from our professional design study which indicates that we can expect 345,000 kWh of electricity a year. The cost of the installation and associated activities was £750,000. There is a guaranteed buyer for all the electricity we produce and the Feed-in Tariff, indexed and guaranteed for 20 years, provides an assured income. We hope to raise as much of the funds needed as we can via the share issue; the maximum investment is currently £40,000; the minimum investment £250; anticipated annual dividend 3-5%. We are aiming for the maximum possible equity to debt ratio, as this will enable us to devote more of the operating surplus to other community schemes, rather than repayment of debt. Any operating surplus arising after we have met our outgoings will be used for wider community benefit. This will include schemes to reduce carbon emissions, assist in adaptation to low carbon living and increase energy security in Whalley and the surrounding area. Funds may be given as grants or loans to organisations such as village halls, schools and sports clubs as well as to residents and businesses. 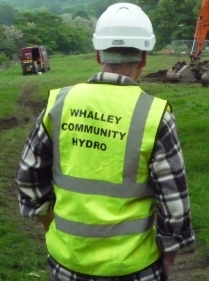 We have received grants from DECC, NatureSave, Whalley Parish Council, Billington and Langho Parish Council. Key Fund has provided a loan for the initial stages of development. We acknowledge with gratitude the assistance of all our funders.